I made little change in this recipe I didn’t addMint Leaves (pudina) , hing.or redchilli powder.. ( Instead of Pudina I added coriander leaves ) Instead of grating chillies I reduce the chillies and ground into coarse paste!. Cut the butter into cubes and mix it in with the flour using a hand held mixer. It should be a bread crumb consistency, Knead this as much as possible to make a dough. Add the Ginger paste + little coriander leaves finely chopped+ green chilliespaste+ cut curry leaves and mix well. Add 1 tsp of yogurt and mix well. Make sure that the dough is stiff .Add another ½ tsp yogurt only if required. Knead well for another 2-3 minutes and keep aside. Take a small portion of the dough and roll like a chapathi until it is ¼ inch thick cut into desired shapes with the help of cookie cutter and place on a greased baking tray. Prick the top with fork and brush with butter on each of them. Bake for 20 minutes or until golden brown. or until done. Great snacks to have in the evenings with a hot cup of coffee.Looks yum. Looks so crispy.. nice recipe! Woww thats a delicious and tempting cookies..will try out soon..
Nice try.Hot and spicy cookies. Sounds great,sounds like my kid of recipe! I love to try it out! Crispy and spicy... Looks perfect too... Would have had the entire batch!!! Savory cookies sounds perfect for a nice evening snack!!! looks nice spicy and crispy Jaishree!!! wow hot & spicy cookies. looks very crispy n nice!! 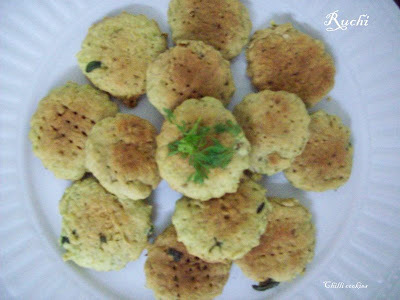 Crunchy and yummy masala cookies!Perfect with evening tea.